I’ve embroidered around the stem and made it to the wavy parts. By this time, I’ve already switched to split stitch in the darker green along the inside edge of the stem. I’m working in longer split stitches, in lines, and as I work the next line next to the previous to fill up the area, I stagger where I place the split stitch so that I don’t get any obvious ridges in the stitching. Underneath the yellow felt turn-overs, you can see that I’ve worked some long and short stitches in the darker green. I’ll fill the waves with long and short stitch, bringing the color in the wave sections down to meet the main stem, following the “curl” of the wave for stitch direction. What size is the piece? The piece is exactly the size of the PDF print-out on the original pattern – it’s smaller than six inches all around, I believe – just slightly smaller. Many of the photos are close-ups, which can give an incorrect perspective on size. I’m using one strand of silk Soie d’Alger, though, which is about the size of one strand (taken from the six) of regular DMC embroidery floss. Most of the gold threads I’m using are relatively small in diameter; for example, I’m using a #4 smooth passing thread, which is one of the smaller sizes of smooth passing. Have I gotten to the point of losing interest? I haven’t lost any interest in this project at all, the whole time I’ve been stitching it! The green stem did seem a bit tedious time-wise to fill up, but it was easy, relaxing stitching, so it didn’t really bother me. The whole time I’ve been working on the project, I’ve been looking towards the end, eager to finish and see if I really like the finished product! How long do I let a project go stale before pitching it? If I’ve stopped working on a project, it is usually because I’ve lost interest in it, or because something else that is of more interest to me comes along. If I’ve lost interest in it – if I got out of it what I wanted and can’t force myself to take it up with any pleasure, then I have no problem boxing it up. I’ll keep it – sometimes for a very long while – on the chance that it may pique my interest again, which often happens. If I’m working on something that I realize I really can’t stand and will never finish, I try to find someone else who might be interested in it. I don’t like the idea of chucking something if any expense has gone into it, that’s for sure. And what I don’t like, someone else may like very much, so I always think it’s worthwhile trying to find someone who might want the cast-off! If it’s a case of something else coming along that is of more interest, I pretty much know I’ll get back to the first project – it gets relegated to my “current projects” basket, and normally, I’ll end up trading it out now and then just to add variety to my stitching routine. But instead of hearing my take on this, it would be interesting to hear what everyone else does? A reader asked how long I keep a project around if I’ve lost interest in stitching it. What do you do? Finally, just an observation – the photo above is the 100th photo in this series covering the goldwork pomegranate! I had no idea I had published that many photos for this project!! Next time I post on this project, I’ll have some better up-close photos, and we’ll chat a bit about long and short stitch and split stitch and so forth! I start these complex projects that deal with optical illusions. It is a needlework obsession for me. I don't finish them. I box them. One is a quilt fabric with faint lace print. I have matching real lace and matching trim. I want to connect them using needlelace to make it appear to have grown out of the fabric! Another project is a Shishka mirror project. I have every size and shape of black spangles, sequins and beads and jet fabric that I want to embellish but again I boxed it. Many more boxed projects sit around useless but I am sure that "One Day" I'll get to them! Dear Mary, I have really enjoyed this goldwork project thus far, as my knowledge of goldwork is about zero, I dutifully posted your letters to a special file marked Goldwork on the computer. Hopefully one day soon I may be able to get the right supplies to try my own piece of goldwork. Well at least one can dream. So what is next? I hope the lilac breasted roller of Trish Burr!! I did not forget. Hope I didn't wake up sleeping dogs. Kind regards Elza Bester Cape Town. You are really amazing! Your work is like no other…Simply Beautiful! Hi Mary! No, I wouldn't have thought you'd posted so many photos of this project either, are you sure? ?=) It's worth it though and has been very interesting to follow. Almost all my projects are gifts for other people, so that really motivates me to get them finished. Maybe that's why I've stagnated stitch-wise at the mo?? Or maybe I'm just too darned tired for more than reading others' blogs!!!!!!!!! Ooooh, Elizabeth! It's funny you should ask that question. I just did a major clean-up today of the various "baskets" that I keep inside. (My studio is "outside," so for convenience, I tend to build up a few baskets of things inside, that I need to clean out now and then. So… today, I cleaned out everything except four projects that are in some stage of progress: 1. the goldwork project; 2. the blackwork fish; 3. the floral glove needle case; 4. a set of (notice how I combine this one?!) Susan O'Connor flowers from her recent book. The first three are in stitching stages. The last one, which is actually three different designs, is in the set-up stage: I've picked out the ones I want to do, reduced the patterns by 50%, cut the fabric, and picked out the threads – I haven't transferred the designs yet or put them on frames or started stitching. But lately – actually, over the past three weeks – I haven't flipped back and forth between projects. I've worked consistently on the goldwork project, hoping to finish it every weekend, and never quite getting to the finish point, because of sickness at one point and busy weekend schedules the other times. How many have been packed away? I don't really have too many "unfinished" pieces. I think I have two right now – the Schwalm teacloth and the Long Dog Sampler piece that my niece and I were doing. Now, on the list of things I WANT to do, I have plenty of projects! But…. I better not get into that right now! Ohhh, the honesty of everyone writing about unfinished projects makes me smile. So many reasons that causes us all to have them and the reasons are so legitimate. LOL. I have to laugh at my own self for an unfinished cross stitch of Old Town Row Houses that was started in 1989! Dreadful! And I love that picture and would still love to have it finished but of the 8 houses in a row only two are finished! But I keep it because one day I may get the interest back that once inspired me to buy the fabric, thread, pattern and that special frame we talked about two months ago. Your goldwork is stunning and the patience needed to complete even one small goldwork project is great and I admire you for working on something so detailed and sooooo beautiful!! I hope you have a nice place to show it off when it is finished. 100 photos! All to our benifit. A picture tells a thousand words, like they say. Thanks again. 100th Photo in the Goldwork series! Wow! I cant imagine. But thanks for sharing so many details on Goldwork using these beautiful photos. I have just one counted cross stitch project which goes in and out of my work area with amazing regularity. I have finished only a third of the project which is 18 inches by 36 inches. Picked it up a couple of years ago as the perfect piece for a niche in the family room but other projects have been completed and this continues to languish in the Unfinished list. Loving this goldwork project and I didn't realise it was as small as that. I can tell you have really enjoyed this (remembers the rooster!). What are you going to do with the finished item – oh did you put the rooster in the tray – thought that was a great idea. As for unfinished work – at the moment I am working on a famous face for a friend who is visiting in 12 days time so have a deadline. I usually do pieces as presents which keeps me to a deadline which helps. Just bought 100 anchor silks on ebay – oh the colours – just love looking at them and not sure what I will do next. Your goldwork project is fabulous, and I know that the real thing is always many times more impressive than the photo. I like very much the colours and the shape of the design. When it comes to finishing things – I keep them until I do. There's precedent in the family – my mother has a tablecloth it took her twenty years to finish! look fabalous stiching for ur project. it looks beautiful. I love embroidery and have done many things, but I’ve just ordered a book on goldwork. I want to be able to play when I get the book, but I’m so confused about what threads to order to even start. 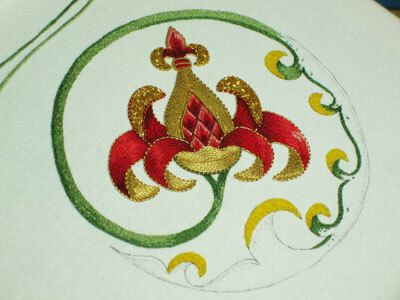 Suggest to me what I need for beginning with goldwork? Too many options and none that ship quick! Thanks.